Get smart—with the right dumbbells! Built for durability and easy to handle, they’re the perfect solution for any light resistance workout. 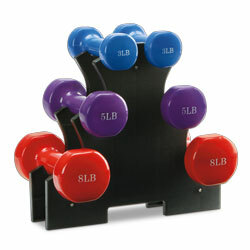 Plus, the convenient storage rack keeps your dumbbells organized and looks great in any fitness setting. Important: This product is only available for shipment to residents of the continental United States.